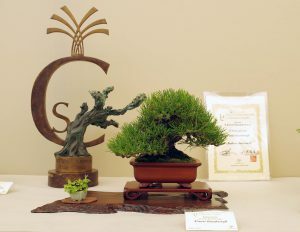 All collectors and professionals-experts who can present a shohin bonsai of high quality can take part to the Crespi Shohin Cup 2019. Everyone of them can exhibit just one tree and be present as an individual participant or as a member of a club or an association. a voucher for the amount of 1.300,00 € for purchases in the Crespi Bonsai shop; the Crespi Shohin Cup; a page on the Italian magazine “Bonsai & news” will be dedicated to the winner and to his/her exhibited shohin bonsai. – The participation in the Crespi Shohin Cup competition is only at invitation and it is not necessary to send a photo of your own trees for the selection. – The invitation will be sent by the organizers to the professionals-experts and collectors of high level, by post or e-mail. – The people invited have to entrust their bonsai to the exhibition place (Crespi Bonsai, Corso Sempione 35, 20015 Parabiago, Milan, Italy), from 7th to 12th September 2019, during the working hours (from 9.00 to 12.30 and from 2.30 to 7.00; Sunday: from 9.30 to 12.30; Monday: from 2.30 to 7.00). 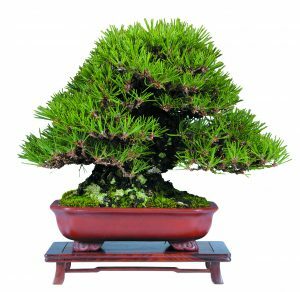 – The bonsai will be displayed without any owner’s reference from 13th to 15th of September 2019. – A jury consisting of international experts will select the most beautiful shohin bonsai, whose owner receives as a prize a voucher for the amount of 1.300,00 € for purchases in the Crespi Bonsai shop, as well as the prestigious Crespi Shohin Cup. – Crespi Bonsai will make any effort to maintain the entrusted trees in healthy conditions. – The participation in the exhibition is free of charge. Are you a collector or professional and do you wish to be invited? The winner of the Crespi Shohin Cup 2017, Andrea Scarenzi with a Pinus thunbergii. The entrance to all the technique demonstrations, conferences and performances is totally free, and also some didactic laboratories. During the event it will be possible to reach the Crespi Bonsai’s nursery. VISIT AND WIN A BONSAI! Come to visit the competitions scheduled during the 13th International Bonsai & Suiseki Meeting: it is enough to vote the bonsai tree you like best, according to your own judgment, from the exhibition-competition “Enthusiasts’ Exhibition”. Among all those who will vote, the winner of a beautiful bonsai will be drawn.